I would like to begin this tribute to Sister Rose Bernard with a short poem from Rabindranath Tagore, the poet laureate of India. Rose was an avid reader and loved the works of Tagore. This poem is about love. And rest on my silence. And dawn in my awakening. And flow in all currents of my own love. 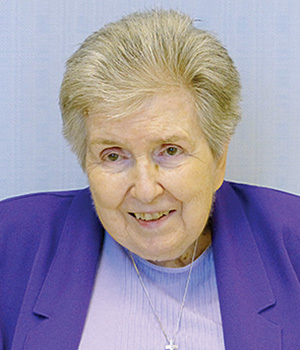 Rose Bernard asked Sister Margaret Ann Nowacki to write her memorial when she became ill two years ago. I would like to share some of it with you now. 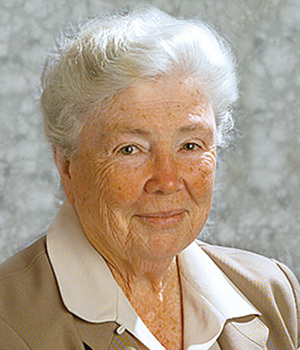 “Sister Rose Bernard was brilliant and had an encyclopedic mind. She was what you might call a life-long student, always in search of more information. Studying for her Ph.D. from the Catholic University of America surely honed her already natural thirst for knowledge. She was never satisfied to have just the bare facts about anything. It was important for her to know the origin, the people involved, and any ramification that might develop—and she did research to find the answers. “The computer was her good friend because it made many of the answers she sought available at her fingertips. It gave her great joy to follow the links that led to further investigation. “Though she was trained as a nurse, Rose Bernard was never missioned in the field of health care. However, her knowledge came in handy in her years in Bangladesh where health care was not readily available. 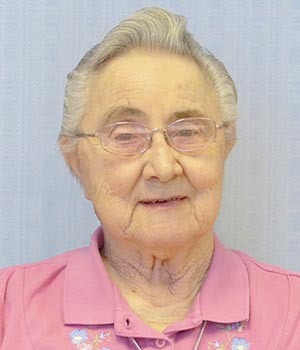 Sister Barbara Jean told of the time a villager rushed to ask for help when a child fell out of a tree and broke his arm. Sister Rose Bernard relied on her training and set the boy’s arm with no problem, such was her depth of applied knowledge. It was not just surface information. 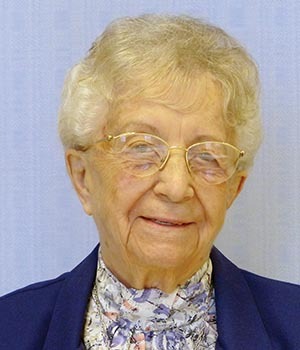 “Community and community life were very important to her. She loved the opportunity to pray The Office together in local community. Rose was a very private person except when it came to community prayer where she willingly took the lead. 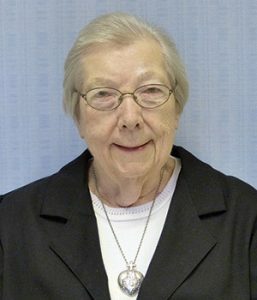 As part of her retirement ministry, and unbeknown to most in the Congregation, each morning she went to the convent’s New Life community where she led The Office with the sisters. She also prayed the Chaplet of the Seven Dolors with the sisters each Saturday morning. 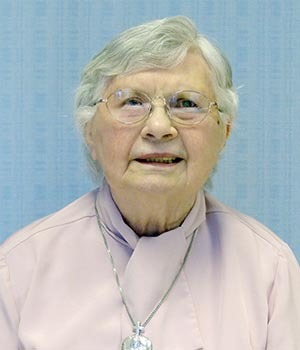 “Another favorite aspect of Rose’s retirement ministry was helping the novices in the International Novitiate improve their English comprehension and reading skills. The success of these young sisters was very important to her and she rejoiced in their efforts. Teaching them one-on-one was just right for her because she could focus on the needs of each one and set goals for their individual mastery. “When Rose Bernard was in Bangladesh she was the social science professor at the National Major Seminary and an advisor to the Holy Cross College Alumnae Association. Her position at the seminary included giving occasional conferences and directing the monthly retreats for the seminarians. She was a valued member of the staff and worked hard to contribute in a positive way to any project given priority. She was a font of knowledge and was no procrastinator. 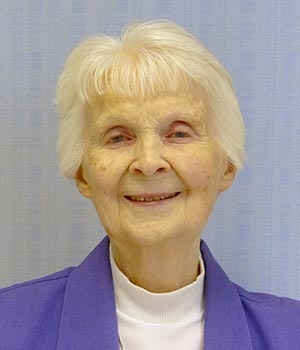 In addition to Margaret Ann’s tribute I want to add something about Rose’s life in Bangladesh where she ministered for 40 years—13 years at the college and 27 years at the National Major Seminary. 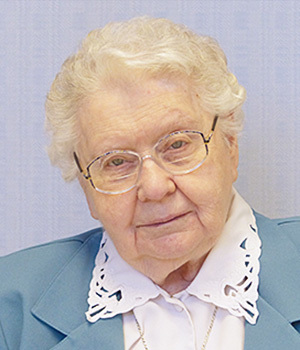 Rose Bernard felt called to the missions where the first Sister Rose Bernard had ministered and founded the community of Bangladeshi sisters called Associates of Mary, Queen of the Apostles, in 1933. She died in 1938 in Toomiliah at the motherhouse of the sisters she had founded. They now have over 200 members. When our Rose Bernard was called to the missions she was joined by Sisters Patricia Burke and Julia, all three of whom were nurses and midwives. Sister Augustine Marie, the superior in what was then East Pakistan, had been asked by the bishop there to begin a college for women in Dhaka. She asked the superior general for three teachers for the college. To her surprise, three nurses arrived, a shock to her to say the least! However, since she was halfway around the world, there wasn’t much she could do, but make do! All three worked in Toomiliah village with the people. 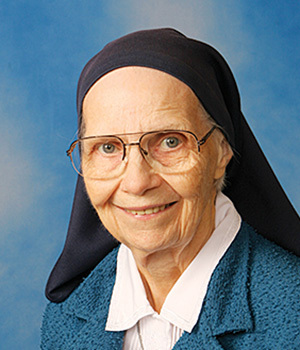 And after two years of nursing, Rose volunteered to go to Dhaka with Sister Augustine Marie to start the college for women where she spent many years. There is much more that could be said about Rose Bernard, but I will close with a prayer from Tagore that I feel would be a prayer that Rose would also offer.